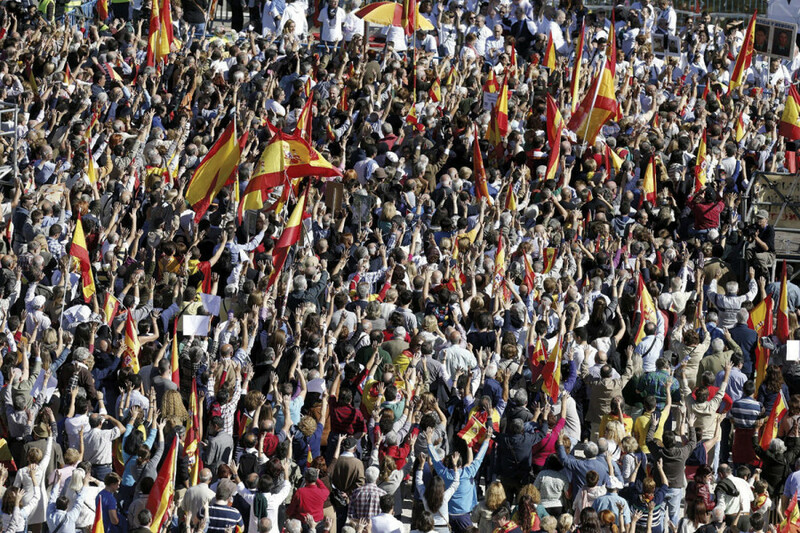 During the past year the political landscape in Spain has undergone a massive upheaval. For over 30 years the country has been governed by either the Socialist Party (PSOE) or the People’s Party (PP), but that two-party dominance is undergoing a serious challenge that started with the meteoric rise of Podemos. This ‘populist’ party arose out of protests against the harsh austerity policies that the government imposed on ordinary citizens after the economic crisis. In less than one year its popularity rose dramatically from almost zero to just about equal to that of the two dominant parties. Another recent force in Spanish politics is the centrist Ciudadanos party which has expanded from its regional base in Catalonia to gain popularity throughout the country. With national elections coming before the end of the year it appears that, instead of the usual two party contest, we may be watching a four horse race that could lead to genuine changes in the way Spain is governed. Before the economic crisis of 2008, Pablo Iglesias was a little-known professor of political science with a pierced eyebrow and a ponytail. He taught his students that politics was the study of power, and that those in power could, and should, be challenged. His stance was clear: the unabated rise of rampant capitalism based on greed, globalisation and privatisation was the primary cause of the problems faced by ordinary people. Iglesias came to the attention of the public during the “indignados” movement against government austerity in the spring of 2011, and he gained popularity by clearly stating his positions on television and in speeches. Finally, in January 2014, he and his followers launched their own political party and gave it the name Podemos (“We Can”). With little money and no infrastructure it was seen by most experts as just another protest party that was destined to quickly fade away… but they were wrong. One year after its founding Podemos had rocketed to the top of Spanish political polls. In January 2015 over 150,000 people crowded into Madrid’s iconic Puerta del Sol to hear Iglesias give an impassioned speech in which he railed against “la casta” (the caste) – his name for the corrupt political and business elites who he says have ruined the country. Political analyst Jose Ignacio Torreblanca explains the rise of Podemos this way: “There’s a demand for change in Spanish society, and anger at the effects of the economic crisis and its management – particularly with regard to corruption. This new party, thanks to the charismatic leadership of Pablo Iglesias, has managed to channel that demand for change.” Podemos is transforming politics with a new form of open direct democracy. They use cutting edge technology to connect with their followers through transparency websites, online voting, and a debating site called “Plaza Podemos” that attracts upwards of 20,000 visitors each day. Much of their success has come at the expense of the PSOE which had traditionally been the party of the people, but had drifted farther and farther to the centre in recent years. Many now see them as part of “la casta” and have defected to the genuinely populist message of Podemos. In response the PSOE has elected their own new young leader, Pedro Sánchez, in hopes of reinvigorating their image. The rise of Podemos has also paved the way for the centre-right party Ciudadanos (Citizens), whose rapid growth has led many to refer to it as the “Podemos of the right”. Ciudadanos (also known as C’s) offers a safe alternative to those who want change, but are afraid that Podemos is too radical. It also has, in Albert Rivera, a young and charismatic leader of its own to rival Iglesias. On May 24 Spanish voters went to the polls in regional elections that were seen as an indication of whether these new parties would be able to have a serious impact on the country’s political balance. The answer seems to be yes. Both the ruling PP and their rival PSOE lost votes overall, and in 13 of Spain’s 17 regions neither one was able to attain a majority. In order to govern these areas they have had to negotiate coalitions, and in most cases that has meant the PSOE joining with Podemos and its affiliates. Ciudadanos did not fare as well as expected, but they won enough votes to be able to form some coalitions with the PP (and even a few with the PSOE – including in Andalusia). Even more impressive is the fact that Spain’s two biggest cities will be governed at least partially by Podemos. In Madrid, the PP won 21 seats in the municipal election, but Ahora Madrid, backed by Podemos, took 20, and has formed a coalition led by Manuela Carmena, who was sworn in to chants of “Yes we can!”. The results in Barcelona were even more stunning as anti-eviction activist Ada Colau, who is supported by Podemos, won the most votes in the race for mayor of Spain’s second largest city. Here on Ibiza there was also some movement to the left as the PSOE, with the help of Podemos-backed Guanyem, can take control in Ibiza town and San José. In addition, the GxF party in Formentera has won an absolute majority to implement its liberal policies based on social justice and sustainable ecology. The question remains whether Podemos and its affiliates can sustain their momentum in the upcoming national elections. It is one thing for people to cast a protest vote in a local election – yet quite another to entrust the future of their country to a party with no governing experience. In addition, the two major parties have the advantage of strong financial backing and the political infrastructure to mobilize voters. On the other hand, the supporters of Podemos are encouraged by the success of their political ‘cousin’ – the Syriza party in Greece. This party also rose from obscurity by campaigning on a pledge to relieve the suffering caused by imposed austerity and corruption. In January, 2015, they won the Greek elections, and immediately set about implementing programs designed to make things better for the majority their citizens.